Remember tomato plant that Lundulph rescued from the drain outside our house? It's now taller than me and I'm about 160 cm. The plant is very leggy, which was to be expected in the circumstances. But the plant did set fruit and the first one was promptly named Tom. Well, Tom went red the other week and a couple of days ago, he fell off his perch, so Lundulph and I ate him in a ceremonial way. He was the size of a regular cherry tomato, but smelt very nice and had a bright warm red colour. Flavour was very good, but the texture was on the mushy side. Also the skin was very thick and reminded me of my childhood, when I refused to eat tomatoes until my Mum had peeled them for me. I suspect that whatever tomato seed sprouted, it was some sort of hybrid that didn't come true to form and instead exhibited these undesirable qualities. However, there is a second fruit ripening as we speak, Tom's brother Dom and there was one new flower yesterday and several other buds coming along, so we may well have more pickings this Spring. It's good as a proof of concept, but once we have a greenhouse, we'll select a known variety. The other day, I stumbled upon the new cooking show from The Hairy Bikers. I find them quite entertaining, though I've not tried any of their recipes before. The cooking show is called "Mums Know Best" and I watched episode 3 entitled "Simple Suppers". One of the Mums that the Hairy Bikers visited was Harjinder from Manchester, who was amazing. I liked that she cooked in massive amounts and had a pretty fully stuffed fridge and was in awe, when she actually started cooking and just couldn't stop. It seemed that once she'd reached two-thirds into one dish, she just started another one. One thing that she demonstrated and that was provided in her list of recipes, was the Chicken Curry that just looked lovely and also had the basic Tarka masala sauce that forms the basis for the majority of Punjabi cooking and which can be made in large batches and frozen in decent sized portions, only to have the meat of choice added to make up a quick meal. I got all the ingredients together, the only thing I wanted to try and couldn't find in my local supermarket was ghee. So grape seed oil had to do. I also had shop-bought garam masala that had a lot more spices than Harjinder's, but looking at her list and the ingredients of the stuff I had, I got away with using just that pretty much. However, I hadn't read through the recipe very thoroughly and got a few things in the wrong order. Some things I chose to ignore and so I'm writing down what I did, because the end result was well tasty. I'd originally planned to treble the sauce and freeze for later, but decided against this at the last minute and a good thing too, because I don't have a big enough dish to cook it all in. Wash and/or peel the vegetables as needed. Dice the potatoes and parboil for 10 minutes, then drain and set aside. Remove the hard stalk bits from the fresh tomatoes and cut a shallow cross at the bottom, then dip into the boiling potato water for a few seconds. Then peel the skin and dice. Chop the onions and garlic. Cut the chicken breasts in largish chunks. Chop the fresh chillies if you want hotter curry. If the canned tomatoes are whole, tear them up into pieces with a fork. Heat up the oil on high, then add the onion, garlic and cumin and fry for a few minutes until they go golden brown around the edges. Keep stirring occasionally. Add the canned tomatoes with their juice, bring to the boil and simmer for 3 - 4 minutes. Add the ginger, fresh chillies and bay leaves and simmer for a further 3 - 4 minutes. Add the chicken and the spices and keep sirring until the meat has sealed/browned. Then turn the heat down to medium, add the hot water and the potatoes, then let simmer for 10 minutes uncovered. Add the fresh tomatoes and the coriander, stir in and simmer for a further 5 minutes, then serve. In theory the potatoes could go in raw, but with the parboil, they went just a little mushy around the edges and thickened the dish into a stew. The texture was great as was the level of spicy heat - I added the fresh chillies whole. It could have benefited from broccoli both for colour and for taste, so that's a thing to add next time, because this is a definite repeat. Or skip the potatoes and serve with rice, should work as well. Lundulph actually wanted turkey because he prefers the texture, but a month after Christmas in the UK, there isn't a single turkey to be found, so chicken had to do. He also liked the texture achieved with the parboiled potatoes, he said it reminded him of dishes with dhal - slightly watery, but yet with body, which he associates with Indian food. We're now set for a week of chicken dishes, since I also made Thai green curry the other day. Once again, this is a thing that Lunduph has been hankering after for ages and since I needed a dessert for this evening, I thought I'd give it a go. I've also recently become the proud owner of Gaston Lenôtre's Desserts and Pastries and thought I'd try it out. Well, the book only has the Crème caramel recipe and it calls for 4 eggs + 8 yolks. I only had 6 eggs handy and by the way the book calls it Crème à la Vanille Caramelisée, so had to skip it this time. I've made crème caramel once before, on the first time my parents-in-law came to dinner. Then I used my Mum's recipe and it didn't work quite - I didn't serve it because I couldn't get it out of the bowl. And last night, I couldn't find the recipe either. This is a dish that should be made at least on the night before. So I had to resort to Delia's Complete Cookery Course. Generally the recipes I've tried from this book, I didn't like much, but it was an emergency. And this book has two different recipes, one for crème caramel and another for crème brûlée. The former is baked in a bain-marie in the oven, whereas the latter is cooked on the hob, like custard with corn flour as thickener. Whether this is the main difference to these two or not, I don't know. My thought originally was that in crème caramel the caramel goes in the bottom of the dishes, so that it melts and goes runny when the desserts are taken out, whereas the crème brûlée stays in the dishes and has the caramel on top in which case it doesn't melt, but forms a nice crunchy surface. The crème caramel recipe seemed simpler, so I plodded on with my original idea about these two puds - bake in the oven and do the caramel on top. Anyway, I'll stop waffling now and get on with the recipe. The mixture will end up about 800 - 850 ml, so either one big soufflé dish or 6 smaller ones. A deep baking pan into which the soufflé dish(es) are placed. Hot water to pour into the baking pan so that it reaches two-thirds of the soufflé dish(es). Saucepan to melt the sugar. Heat the milk on low heat, stirring occasionally. Prepare the baking dish(es) and pre-heat the oven to 150 degrees C. Boil the water to have it ready. When the milk begins to steam a bit, whisk the eggs, sugar, maple syrup and vanilla essence so that they just come together, preferably by hand so as little foam as possible forms. When the milk is about to start boiling, pour it into the egg mixture and continue whisking briskly by hand until it's incorporated. Pour into the baking dish(es), then put the baking tray into the oven and pour in the hot water. Bake for 1 h, then take out and allow to cool completely, before chilling in the fridge until needed. Just before serving, melt the sugar in a saucepan on medium heat. This should take about a minute. Do not stir, just shake a couple of times, then when all the sugar has melted, quickly distribute over the crème brûlée and twist and turn the dish(es) to cover the whole surface. It'll bubble a bit as it meets the cold custard. This must be done quickly or the caramel will harden in a too thick layer. I definitely need to practice on the caramel. It burnt bit, I wasn't quick enough and the crunchy layer was a bit on the thick side. I initially tried with my tiny kitchen blow torch, but it didn't work at all, I think the blow torch is too small, practically a cigarette lighter and I would have run out of the lighting fluid and overheated it, before the sugar melted. Or I used too much sugar. I tried caster sugar and also icing sugar, but it took forever and I gave up. Delia recommended melting the sugar in a sauce pan and that's what I did. One thing that Delia recommends is to break up the surface before serving, but both Lundulph and I disagree, it's great to get a little dish with the golden shiny surface and to whack it lightly with your spoon and hear it crack. The custard was lovely and creamy, but the dark caramel dominated the taste and the finer hints of vanilla and maple syrup didn't come through as I'd hoped. Still, very encouraging for a first try and I'll keep practicing. However, I made the massive mistake of using an electric whisk for the egg mixture and I kept whisking until it pretty much filled the 2 litre bowl, it was that foamy. When I added the milk it went over the edge and made a good portion of my work surface very sticky indeed. I ended up skimming off as much of the foam as I could into the sink. Lundulph also reckons if the custard goes up to the brim of the dish, sprinkling thin layer of sugar, then holding the blow torch so that the flame is parallel to the surface would do the trick, whereas my dishes ended up half-full and I had to point the torch down into them, thus perhaps I failed at getting the perfect thin layer of caramel. To continue from my previous post on my sourdough revival I let the dough rise for about 5 h. At 4 h 30 m I switched on the oven to pre-heat to just over 200 degrees C.
The dough had risen beautifully and smelt very nice too. I baked the loaf first and had a bowl of water next to it, still it didn't go too crusty and softened further as it cooled down. I baked it for 40 minutes. Second I baked the boule, which spread a bit more than I wanted it to, but not enough to warrant emergency folding. Again I left the bowl of water in the oven, but it didn't seem to generate a substantial amount of steam. Also, since the oven has started to only bake on top, about two thirds into the baking time of 50 minutes, I turned the boule upside down, to get it baked underneath a well. I think I'll get a couple of loaf pans, a bit bigger than the one I have at the moment and use them instead. The dough is soft and benefits from the support a loaf pan gives. So no more free-standing sourdough bread. The crumb was perfect this time, I still can't believe how great the bread turned out from the revived sourdough. Miles apart from the original result last year. And then I did follow the instructions in the book, whereas this time, I improvised to a large extent. Making it up on the fly paid off nicely and I'm hoping I'll be able to repeat next time towards the end of this week. I've kept back what I hope is about 200 g worth of sourdough in the fridge to feed up the day before baking. Another interesting thing is how much the different coatings changed the overall bread flavour. The loaf was covered with oat bran which gave it a nutty earthy flavour, which would be good with jam or soup, whereas the boule was covered with sesame and black onion seeds and seemed to call for spicier foods to go with it. In the mean time, we've run out of crisp bread, so I'll be making a batch of that. Sadly, the gyuvetch was not the success I'd hoped for, although using a bit more oil and double amount of tomatoes at least resulted in it looking as it should. But the vegetables were too crunchy for my liking, in particular the French beans and if I hadn't pre-fried the potatoes, I suspect they'd have been half-raw too. The meat was braising steak, so would require a longer cooking time, and the 14 h of slow cooking had tenderised it a bit, but not to the point where it melts in your mouth. Thinking back, just before I took the pot out of the oven, the thermometer in there was showing 90 degrees C. Combined with the long cooking time, this should have been sufficient to tenderise the meat, but no. So experimentation will need to continue to work out how to do a good gyuvetch every time. Do the same I did the other day, but cook on a higher temperature for a couple of hours, before turning down to slow and leaving it overnight. Only slow cook the meat, then add the vegetables in the morning and cook on higher temperature for an hour or so. Do the same as the other day, but crank up the heat in the morning for the last couple of hours. On the whole, I should experiment with smaller quantities, as there's so much two people can eat and the gyuvetch is not suitable for freezing. Perhaps I should choose a nicer cut of meat and dice it, rather than use the ready braising beef they sell in the butcher's too. So overall, a step on the way, but not quite as far as I'd hoped. It looked a bit funny when I took the jar out of the fridge - it had a thin film of liquid, which apparently is called hooch. I found this out on a new web site I found last week - breadtopia. This site has a lot of interesting information and intriguing recipes, so it's definitely one I'll follow from now on. So I poured out the hooch first. What remained looked a bit like sandy mud and was a bit grayish on top and it smelt a bit different from the original sourdough. However, once I fed it, the look, feel and smell returned. I then put the jar near the window sill overnight, in order to get it at it's peak in the morning. When I got up this morning, the sourdough had had its peak and was on its way down again, however it was still well above it's level immediately after feeding. So I skipped breakfast and started on my bread. I guessed that my starter would now weigh 500 g (original dry sourdough 100 g + 100 g water, then first feed 100 g flour + 50 g water, then second feed 100 g flour + 50 g water), so I scooped out 300 g of the starter, leaving me with 200 g for next time. The consistency was more liquid than in the original run last year, but definitely had the bubbly honeycomb texture. It wasn't as malleable, but stuck to anything. Next, I wanted to avoid ending up with loads of dough and also I wanted to make the dough a bit harder, so it wouldn't just spread out everywhere and went against what the book said on amounts of flour and water. I put everything in the bowl of the Kitchen Assistent except the salt, fired it off at medium speed and let it churn for over 10 minutes. I made myself a cup of coffee in the mean time and towards the end, I added the salt. As is now my habit, I dusted the work surface with flour, took out the dough and folded the edges to form a ball, then back into the mixing bowl for an hour's rest. After that, I decided to make one boule and one loaf pan. So a third went into the loaf pan, the rest went into the basket. Both are now proofing near the window sill, I don't want to leave them for the 16 - 18 hours as it says in Richard Bertinet's book, I think it might be too long. The dough was still quite sticky on my fingers, but came off nicely from the plastic scraper and felt like it had a bit more stamina to it. For the loaf pan, I greased it with butter, then covered that with oat bran and I also sprinkled some on top of the dough. The boule is laid on and covered with a mixture of polenta, sesame and black onion seeds. I bought the onion seeds ages ago an keep forgetting to use them, yet they're so decorative. I'll let them proof now and check them mid-afternoon, to see how much they've risen, if it looks sufficient, I'll bake them. Yesterday was the first big cooking day of 2010. I started out with making more baked cabbage, since I didn't feel I had enough at my Mum's place over the holidays. I also followed my own advice on the blog entry of frying the paprika for 1 minute. At about 45 seconds the burnt smell hit me very hard, but I didn't have the necessary resources to do a second batch, thus, I used it anyway. I've updated the entry to say 30 seconds only. Otherwise it baked fine and is quite edible, but not as tasty as it could have been. While this was baking, I went to the butchers to stock up on meats as we'd completely run out. I bought 2 kg pork mince, 1 kg braising beef and 4 large chicken breasts. The second thing on my cooking list is a new idea that I want to try out, which is Bulgarian meatballs "on demand". The thing is, the meatballs can be frozen, but are never as good when re-heated, so I was thinking, what if I prepare the mixture and freeze it in decent sized chunks, then just defrost one when needed, quickly form the balls and fry. That way it won't require as much planning and will be something that can be done mid-week. So I mixed up according to the recipe and put in the fridge overnight for the flavours to develop. I'll divide it up today and freeze. Speaking to my Mum, she's once again way ahead of me and has already tried this out. Let's hope it works for me as well. Third on the list was gyuvetch, this time with meat. Due to the snow in our area, the shops have been struggling with re-stocking and so I picked what they had vegetable-wise and used carrots, French beans and courgette in addition to the potatoes. In the freezer I also had diced green pepper and peas. I'd also bought a jar of mixed mushrooms in sunflower oil. That's more of an antipasti thing, but should add to the overall flavour. Before starting, I did a quick google search, which spat out the following interesting recipe/video. It's substantially different from the one I make, but had a few elements in it that I'd quite like to try out sometime. What I tried out this time is to make sure the meat gets more colour this time, rather than a quick seal in the frying pan. Then I made sure to fry the onions, carrots and potatoes. I think now that I only slow cook gyuvetch, it's become rather bland of late and I'm trying to figure out why. For starters, I think I've reduced the amount of fat used too much. This time the fat of the mushrooms went in as well. Also I've been skimping on frying the onions and carrots and I think the potatoes might benefit from a turn in the pan too. I also doubled the amount of tomatoes, so let's see if this'll work out better. We're having the gyuvetch for dinner tonight, fingers crossed. 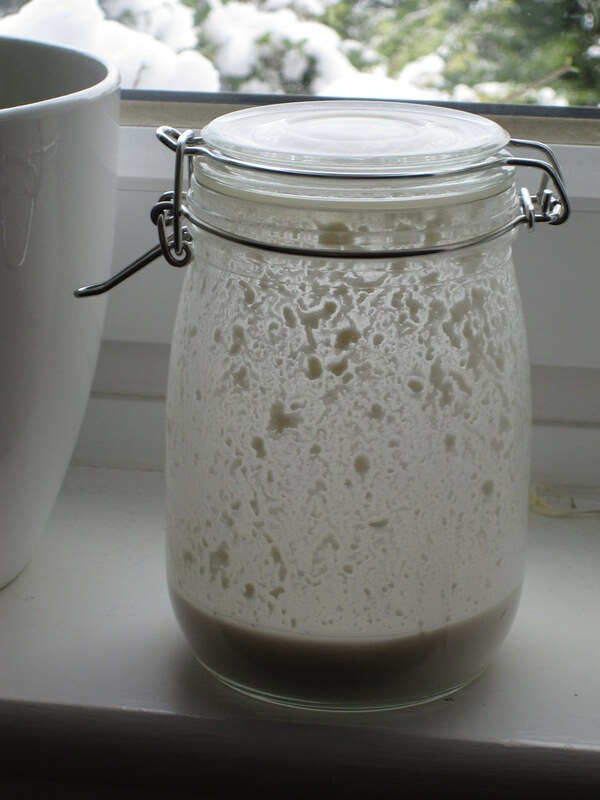 The last thing I did before going to bed was to feed my sourdough starter. The chicken breasts are still in the fridge, waiting to be trimmed and frozen. It has been 24 hours since I fed my revived sourdough and my heart is singing, because it's alive! Most definitely bubbles, not to mention that it had risen, though I forgot to mark the original level. The book said that now it would be the same as at the end of Stage 4 and ready for use. Actually it is quite a bit runnier this time and I don't need to bake right now, so I've put it in the fridge and will feed it in 3 days as per the instructions. This amount seems fairly good and I'll see if I can maintain it without discarding any ferment. It's about half of what I originally ended up with for baking, thus I should be able to manage better and just do one loaf at a time, rather than four in a quick succession. I noticed that it's quite obvious how big it got at one point - double volume at its peak. This is just before I put it in the fridge. I've spent the last couple of days reading up on sourdough and keeping one going, it seems that it can be quite badly neglected, i. e. not fed for a month, while in the fridge and still have some life in it. Or it can be fed once or twice a week and go on forever. Either way, it should be "perked up" to be at the peak of it's abilities when baking. I'll give it a try when I bake next time and I'll also try to make a slightly harder dough next time so that it doesn't spill everywhere. Though that might have been due to over-proofing. Talking to friends in Sweden, it seems to have become so very fashionable to bake with sourdough, that even the shops sell it, though when I looked, I couldn't find any and so didn't try it out, as I'd planned. Just as well, though, my Mum had outdone herself on lovely food as usual, thus no need for additional bread delights. As I mentioned in my previous post, I'm in the process of reviving the sourdough I dried out last year. Neither had any bubbles as the instructions mentioned. I had a sniff at it, still smelt fermenty-sweet, like it did when I made it. So I decided to give it two more days, then throw it in the bin. Today is day 3 and when I remembered to check it (it was hiding behind the curtains now), I noticed a thick layer of bubbles over the surface of the liquid. These mixed very nicely with the ferment in the jar and it is now back on the window sill for another 24 h.
I'm pretty sure it was warm enough for the original soaking of the ferment, so I'm guessing that I may either have killed off the majority of the wild yeasts while drying them in the oven. Or I didn't pulverise the dried sourdough sufficiently, but left it in granules, which take longer to "wake up". Still, hope is still up. In the mean time, I got the no-knead spelt/rye bread ready and baked. It rose very nicely over the 24 h but due to the lower gluten levels, didn't have the strength to hold together. I followed the usual process of resting on the surface for a few minutes, then folding, then resting a bit more, then folding a second time and then I placed it in the rising basket (now that I have one, I want to use it) for a couple of hours. The dough still felt rather "porridge-y" and didn't rise substantially during the proofing. But it was a bit easier to transfer to the baking pot, even if I did flip it a bit off centre. Also during baking, it didn't rise much beyond what it already had and when I cut it, it was denser, but that's how it should be with rye I think. Lundulph said it was a bit salty, so if I repeat this particular flour combo, I must remember to reduce the salt. What I realised after I put in the bread to bake is that I'd completely forgotten to add the bread spices, which I brought with me from Sweden back in September. Dang! Next time perhaps. Most annoying is that I did take them out and put them on the worktop, ready to be used and then turned a blind eye to them. Incidentally, remember Tom the Tomato? Well, he's grown to the size of a golf ball and also has a younger brother Dom. Not only that, the plant is almost as tall as me and it has a second lot of flower buds coming along. How cool is that? God fortsättning, as they say in Sweden, in the days after New Year. Literally it means good continuation, basically a wish for the new year to continue well. We had a really good New Year in Sweden, with copious amounts of snow and more degrees below zero than you can shake a stick at. For starters, I got to paint the New Year dinner bread my Mum aways bakes and she had a brush, which made a big difference. Sadly I didn't take a picture, but I'm definitely getting a couple of brushes for myself. We also went to a New Year's party at a friend's penthouse near the centre of Stockholm. There was lots of Champagne and a great view of the fireworks. My friend and her boyfriend had each made a dessert - she two beautiful cakes and he some gorgeous chocolate mousse. I couldn't resist taking a couple of snaps, which I want to share. This one had cream of forest berries inside. This one had cream of cappuccino inside and the poinsettia flower tasted of raspberry, yummy! There is fluffy chocolate ganache at the bottom and white chocolate mousse on top, absolutely divine. They turned out very popular and I had to make a second batch for my Mum, who particularly liked them with "grillkrydda", which is a spice mix used for coating meat before a barbecue. My Dad thought they were a bit salty and ate the poppy seed ones. Bip liked both I think. We're now back at home and managed to just make it home before the snow arrived, made the scenery look like the one we'd just left, i. e. covered in a thick blanket of snow and made the whole country more or less grind to a halt. Who would have thought? But speaking with my Mum, it got even colder after we left, with below minus 20 degrees C! Put both in a jar, put the lid on and shake well to mix. As you can see, it's now on the window sill, taking in the heat from the radiator. With the Winter all around us and our house not being too insulated, the average temperature has dropped to around 18 degrees and I'm constantly putting on more clothes or leaning against the radiator. The instructions are to keep this for a day or two in a warm spot, near a radiator and not to drop below 25 degrees C. So fingers crossed.